Our management is led by Obinna Okoye, a former Adjunct Professor Of Finance And Management at Strayer University Washington DC and an Ex Staff of the World Bank Group. 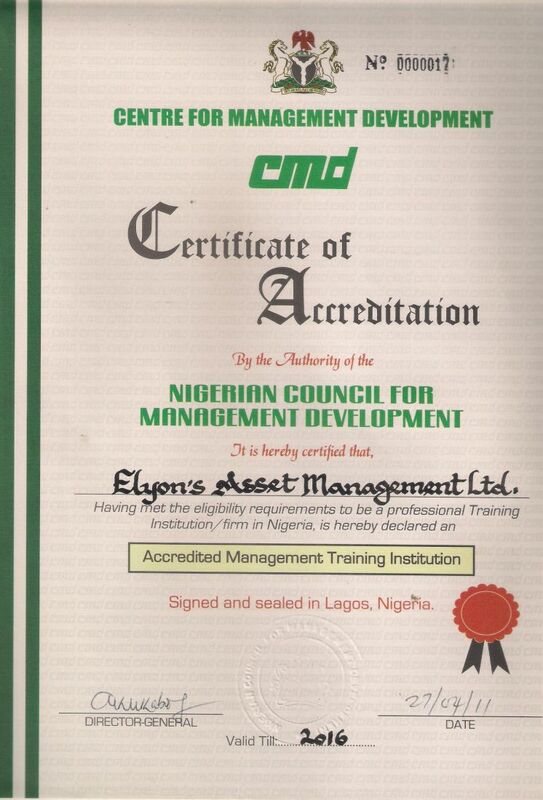 Prime Business School is accredited by the Centre For Management Development (CMD), through itsparent company - Elyon's Asset Management Ltd. CMD was established by Decree 51 of 1976 as the operational arm of the Nigerian Council for Management Development. CMD gives accreditation for institutions to run management training courses in Nigeria. Below is our accreditation certificate. We organise courses in project management, organisational development, leadership, etc in the United States through our affiliate office in Maryland. Address: 6490 Landover Road, Suite B, Landover Maryland 20785. Phone 240 305 7750.